For new head coach Luke Schroeter, the goal for the Canby boys' team is simple: constant improvement. Schroeter stepped into the shoes of previous head coach Alison Nizer after being an assistant coach. For the Canby boys' team, it is going to be an uphill climb in the tough Three Rivers League. 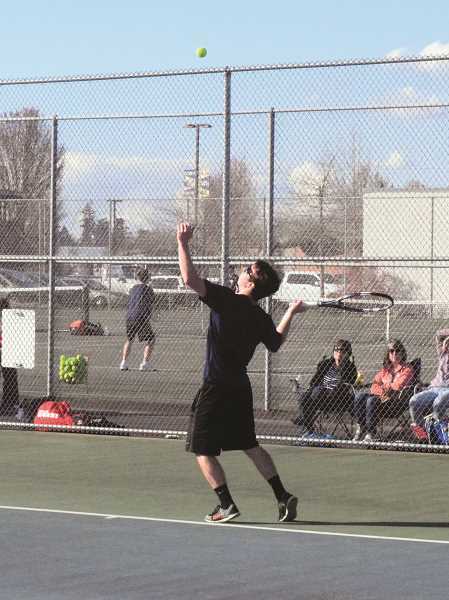 "A lot of my varsity guys only play tennis during the tennis season," Schroeter said. "They aren't playing tennis all year round like a lot of the teams that we play, like kids from West Linn, Lakeridge, and Lake Oswego. They have kids that belong to tennis clubs, and they play every day, all year round. It's hard to compete against that level of competition." Schroeter, a former college tennis player at the University of San Francisco and Portland State University, was on a Lakeridge team in high school that won the state championship as a junior. He knows what it takes to be successful, and also knows adversity when it comes to playing against strong teams. "In college, the teams I played for struggled," Schroeter said. "All of them were teams that lost way more matches than they won. I went to schools that weren't as good but they were still Division I schools that were in good conferences. I've been on both sides. I know what it takes to have a winning team, I know what it's like to be on a team that struggles a little bit." Schroeder added, "I understand where we're at, and I'm all about getting better and my goal by the end of the year is to be competitive, be right there where we're winning a couple matches, and we're at least getting some wins against the top teams in our league. If we can win a third or half our matches that would be great." With new talent like Tyler Newkirk and Ian Quinlan taking to the squad and having a knack for the sport, Schroeter is optimistic. Part of the key to success is getting the team to have fun and by in to the sport. Another part is technical improvement and expanding his players' games. "I always recommend just taking what the opponent gives you, that's probably the best tactic to have," Schroeter said. "Play to your opponents weaknesses, play to your strengths. I teach these kids to have an all-around game. Our biggest weakness coming into the season was our player's inability to volley. A lot of our guys have never been taught how to volley correctly." "My goal for the season is to get everyone excited about tennis, having fun out here, and getting better," Schroeter said. "If you get better at this game, it gets fun. It's a sport that you have to be able to play it at a certain ability level for it to be enjoyable. If you're hitting the ball out every time it's not fun to play."